The monument commemorates the crew of the American brig "Union" which was lost with all hands near Fiji in 1804. The anchor is a relic from an early American whaling vessel. 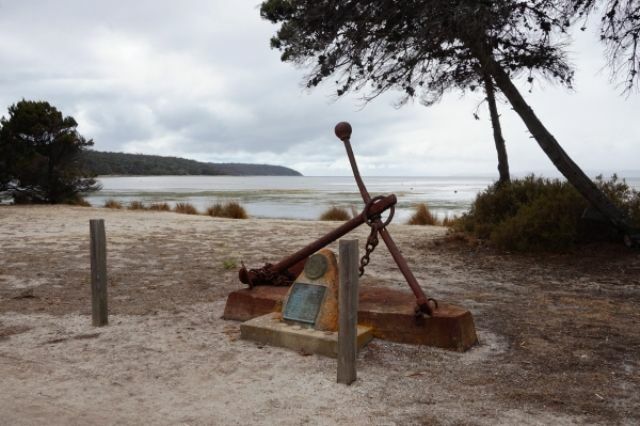 The anchor was recovered from deep water, near the present wharf, in 1969. Americans were sealing around the waters of Kangaroo Island and South Australia well before South Australia was declared a colony and the first settlers arrived in 1836. 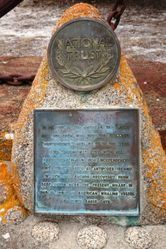 In 1803 the crew of the "Union" built a vessel on Kangaroo Island which they called "The Independence"; this vessel sank, off the Antipodes, in 1806. "Union" was lost with all hands near Fiji in 1804. "Independence" met a similar fate at the Antipodes Islands in 1806. In memory of the American brig Union and her crew, who built the schooner Independence hereabouts in the year 1803. "Union" was lost with all hands near Fiji in 1804. "Independence" met a similar fate at the Antipodes Islands in 1806. This anchor, recovered from deep water near the present what in 1969 is from an American whaling vessel of those early days.